Design ideas for the centerpiece fountain in Danville’s River District Gateway Plaza, at the corner of Main and Craghead streets, have been submitted and will be available for review and comment by the public on Tuesday. 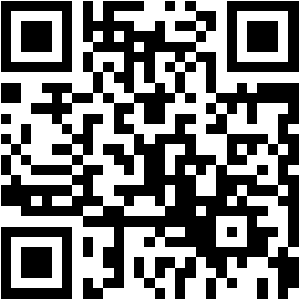 Click here to access this Register & Bee article. The streetscape contractor is planning to mill the asphalt on the first block of Main Street between Memorial Drive and Market Street on Friday, September 21, 2012. There will be no parking available along either side of the street on this block. 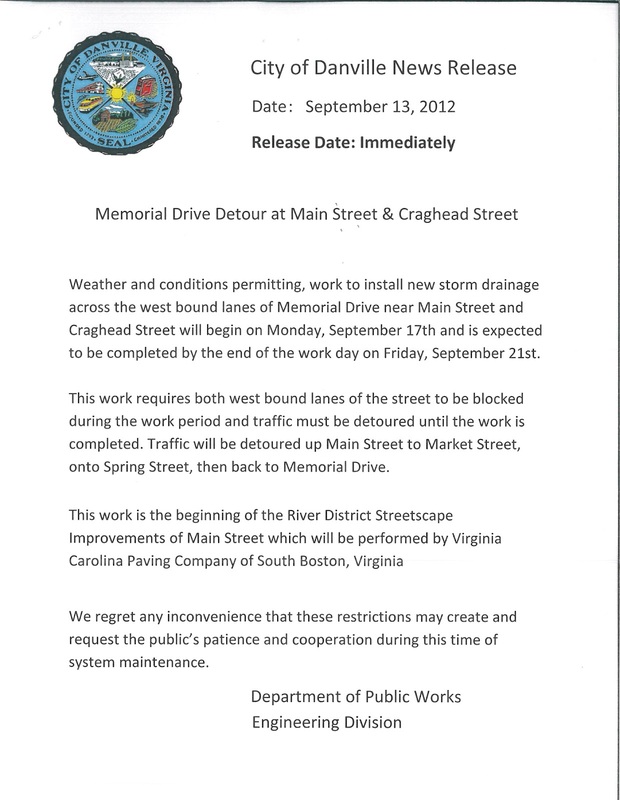 Cones and barricades will be placed that will limit the movement of traffic through this block of Main Street. When the milling is complete, the first phase of sidewalk construction will begin on the west side of the block and on-street parking will be available on the opposite side. The city of Danville and the Downtown Danville Association will hold a series of open houses next week to solicit additional input into the future use of the site formerly occupied by the Downtowner Motor Inn. Open houses will be held from 11:30 a.m. to 1:30 p.m. and 4 p.m. to 6 p.m. on Thursday, Sept. 20, and from 4 p.m. to 6 p.m. on Friday, Sept. 21. All three events will be held at 527 Main St., which formerly operated as River City General Store and Taylor’s Hardware. 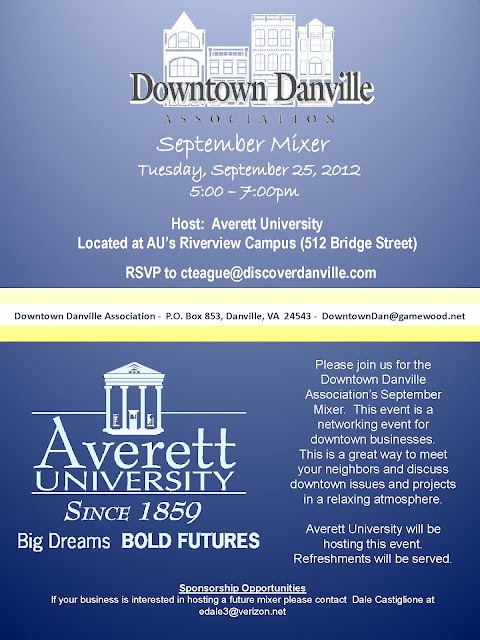 You're Invited to the Upcoming DDA Mixer!! Click here to view map of detour. 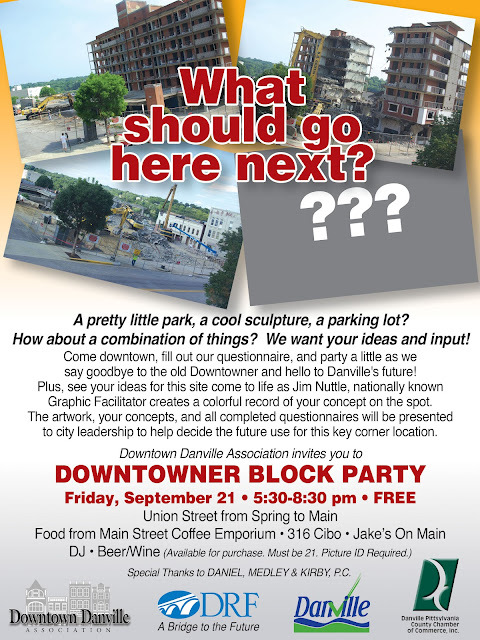 You're Invited to the Downtower Block Party! !